In a decision that seems to have been finely balanced, the US Fed decided yesterday not to raise interest rates on this occasion. Although not resulting in a move on rates, yesterday’s was at least the first FOMC meeting in many years when the fact that rates were kept on hold was something that constituted news. Up to now in modern times all commentators would be writing the words “as expected” this morning. In her press conference, Ms. Yellen contradicted the previous statements of FOMC committee members, including herself, when she included volatile financial markets as well as the downside risk in Chinese economic performance as reasons to explain the reluctance to raise core rates in the US. While officially an emerging market (EM) economy, China does carry significant clout on the global scene. Inflation, of course, is still a bugbear and the Chair of the Fed identified energy prices as the driver here. She was more upbeat on US growth and on the employment record, mentioning that anything that the Fed can do to improve employment will also assist with rectifying perceived inequality in society, a topic that she has dealt with previously. There is still an idea out there that rates will begin to rise this year. There are two meetings left in 2015 in the Federal Reserve calendar, October and December. The October meeting is not scheduled to be accompanied by a press briefing, and it is believed by market participants that rates can only be moved on those occasions where a press conference follows the meeting. 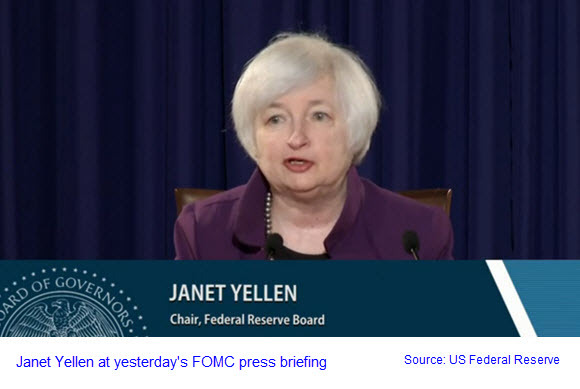 Ms Yellen dealt with that yesterday by saying that, in the event that they decide to raise rates in October, they will call a press briefing and use established practices to make sure that all reporters present can participate.